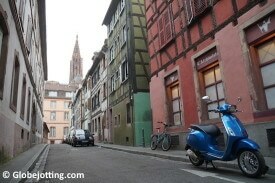 Strasbourg, France: Delightful to explore … on foot. My wife’s suggestion seemed logical at first. Her Uncle Helmut, who had just chauffeured us across the border from Germany into the French town of Strasbourg, had parked his car on the outskirts of the city. We needed to move the car closer to our hotel. Needed to get our luggage. 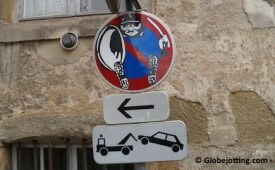 I was the only person in our gang of four who could interpret the French road signs, so … sure. I could go with Uncle Helmut and help him navigate. The flaw in this plan didn’t hit me until we were a couple of blocks away, trying to find the car. Uncle Helmut speaks only German. My German skills are about as developed as my sense of direction. Both are at the level of a three-year-old who is a slow learner. In a city that is a labyrinth of one-way streets and pedestrian-only streets, with traffic laws I don’t understand, and driving on the right-hand side of the road after I’d been living for the past three years in a country that drives on the left, I was about to attempt to translate directions from a language I had not spoken in four years, into another language I don’t really speak. 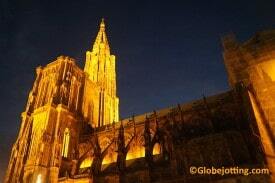 Strasbourg’s cathedral is the sixth tallest church in the world. Somehow, this worked. The only profanity that left my mouth or Helmut’s (I do understand a little German) was directed at other drivers or ourselves, never at each other. Our drive into the town center went smoothly, except for the moment when I instructed my uncle-in-law to drive the wrong way down a street reserved for trams. Strassbourg was delightful. We stopped for one night, and decided to stay a second. Then we were on the road again. A few days later, with all four of us in the car, we had different navigational struggles. My mother-in-law Gisela, who speaks fluent German and English, was back on interpreter duty. This, we all thought, would make navigating easier, until we approached Besançon. Road signs in foreign countries can be tricky to decipher. Besançon dates back to Roman times. The Ancient Romans were highly skilled at many things. Creating street plans that would make sense to automobile drivers 2,000 years later was not, however, one of those things. Besançon’s streets were windy and narrow. A steep road led up to an ancient citadel where we wanted to have a picnic. The citadel was easy to see from down below. Reaching it by car, however, was exceedingly difficult, in part because I’m pretty sure Martians came to Besançon recently and turned the street signs in wrong directions as a sick joke. Further complicating matters was the fact that modern city planners, who are now trying to untangle the original Roman snarl, were laying new tram lines and changing one-way streets to no-way streets. So the way things went during the 90 minutes we circled the city, trying to reach the citadel, is that I would read instructions from my phone’s GPS app, which would lead us once again toward head-on collisions with street cars. 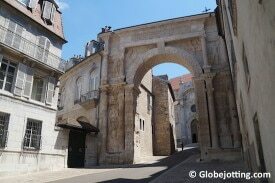 Something the Romans did right: An ancient archway still stands in Besançon. Understanding Helmut’s question, I would say, “Actually, no, I meant go right.” (I do this a lot when navigating under pressure.) So Gisela would translate my corrected direction for her brother. This communication style would have worked fine had we been driving three kilometers per hour or slower, but in moderate traffic, with angry bus drivers honking behind us, what happened instead was that by the time my instruction was fully transmitted, we had missed three more turns. This became sufficiently stressful that at one point, unable to locate an ejection button, I urgently demanded that Helmut pull over into an empty parking lot, far from anything of interest. “Why are we stopping here?” Kattina asked me. “Because I need to sob for a minute,” I said. We eventually made our way to a different parking lot and caught a bus up to the citadel. We had a picnic and discussed the fact that for our next family adventure in Europe, we should rent a helicopter. 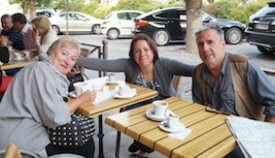 After two nights in Beaune: Everyone’s still smiling at our final breakfast together. In the late afternoon, we continued to Beaune, a town where I used to guide tours and knew how to locate wineries. We parked for the night, found a table at a café on the town square, and ordered some libations. And we understood each other just fine.